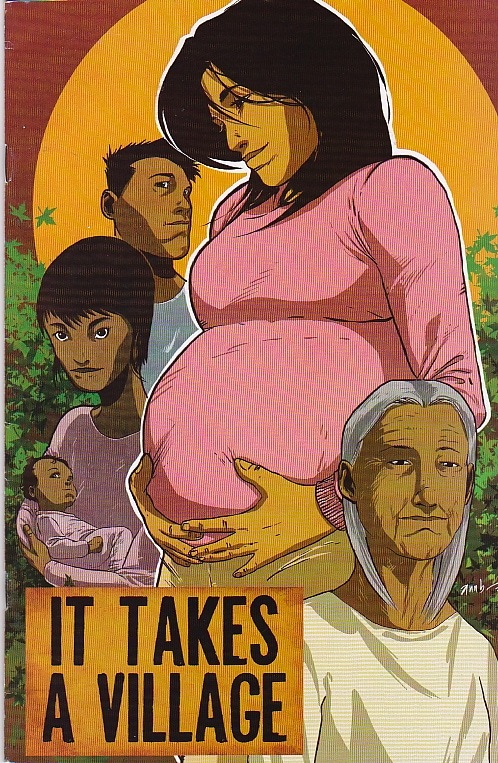 It Takes a Village is a fantastic short comic about a young aboriginal girl getting in touch with her ancestors wisdom about raising and conceiving a child and her progenies spirit as a mother later in life is her guide throughout the tale. I feel that although it is geared to aboriginal teens and young mothers the tale is worthy of sharing with any young parent as the message about respecting your child through your pregnancy and your parents and grandparent wisdom is worthy of passing on to all young parents. In the story the young mother is not with the father but in one part of the tale she sees her partner with her small child and he teaches her that she has an instinct for raising a child that will kick in once the baby is born and she sees that they have a potential to work through their difficulties and raise a child together despite their youth. It is very well illustrated and written and the Healthy Aboriginal Network have produced some excellent comics in the series for youth of aboriginal decent.